Click on blue hyperlinks to read complete reflections and view publications. As we work to live and promote healthy and peaceful lives, I think we can learn from the grace and skill, as well as the perseverance and humility needed to succeed over time in baseball. In life, as in baseball, past "failures" don't necessarily assure or predict future ones -- only giving up on ourselves and others can do that. Healthy relationships and great baseball may be more alike than we might think, in the degree to which they require practice, patience, and forgiveness. 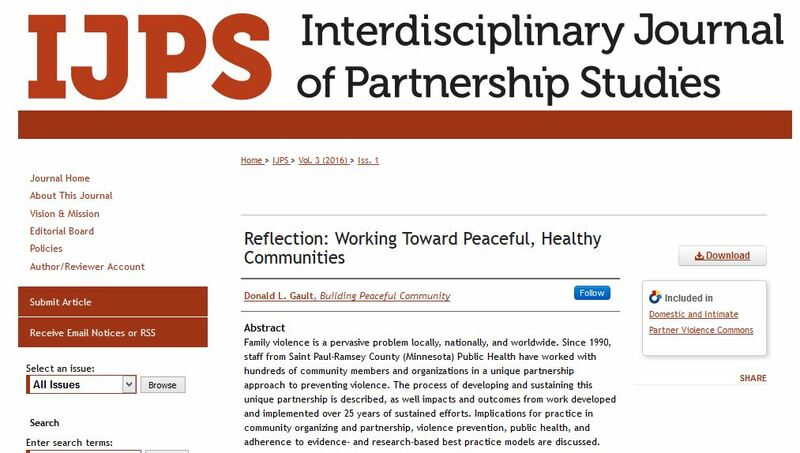 "Reflection, Working Toward Peaceful Healthy Communities," published Winter 2016 issue Interdisciplinary Journal of Partnership Studies. To read, click above. ©Copyright Donald Gault, Building Peaceful Community. ​All rights reserved.